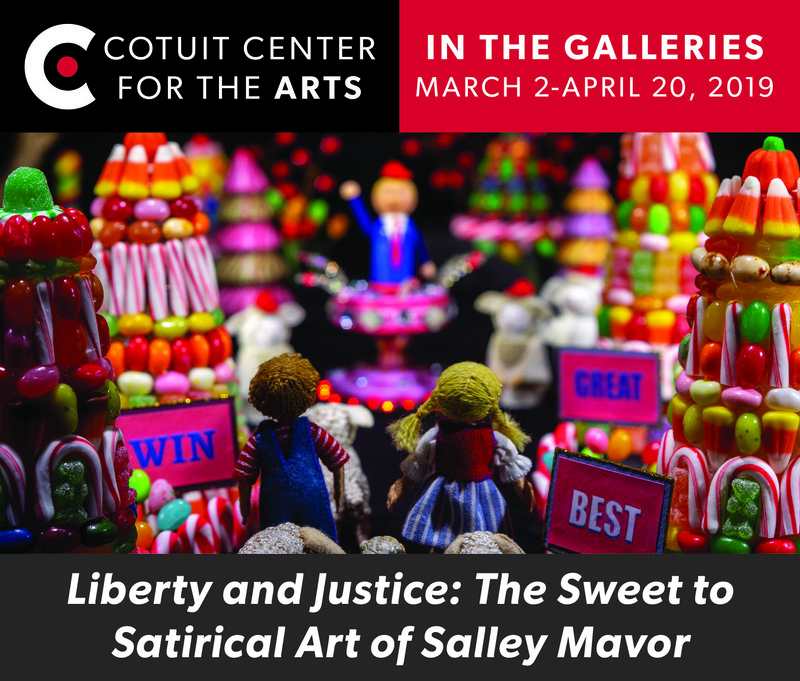 Yesterday, Rob and I went to see my exhibit, Liberty and Justice: The Satirical Art of Salley Mavor at the New England Quilt Museum in Lowell, Massachusetts. When the show was abruptly cancelled at another venue due to its political content, they swooped in to save the day! Since delivering the artwork a few weeks ago, this was the first chance we’ve had to go back and see how it all looks. I can tell you that their curator Pam Weeks (pictured in foreground) did a beautiful job arranging everything in the two galleries. 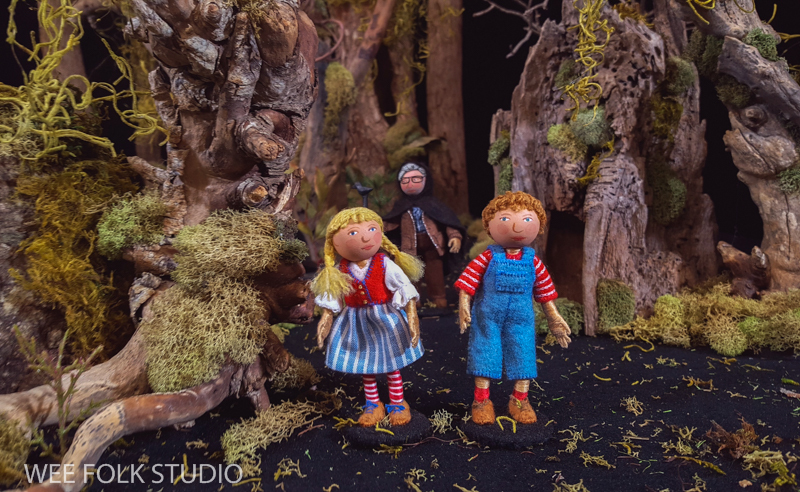 One gallery contains a selection of framed photographs from the Wee Folk Players series, a monitor showing the 14 minute animated film on a loop and a display case full of the real dolls, props and scenery from the film. 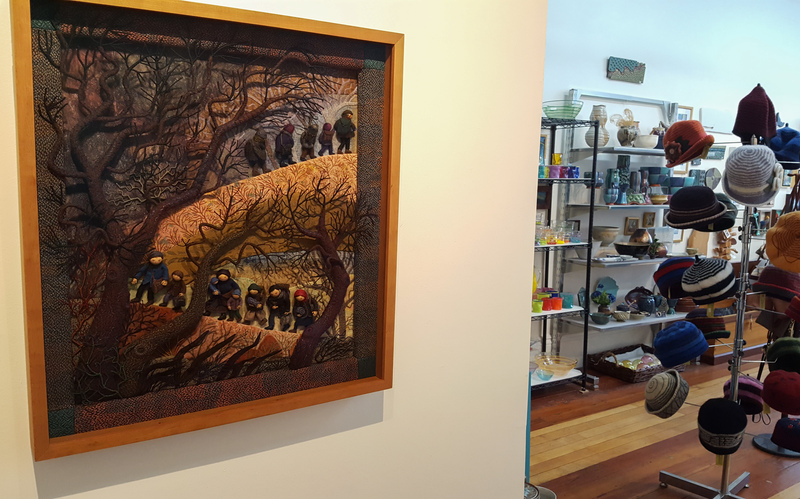 Across the hall is a gallery showing my earlier bas-relief embroideries from what I call “The Innocent Years”, which includes a number of original children’s book illustrations. 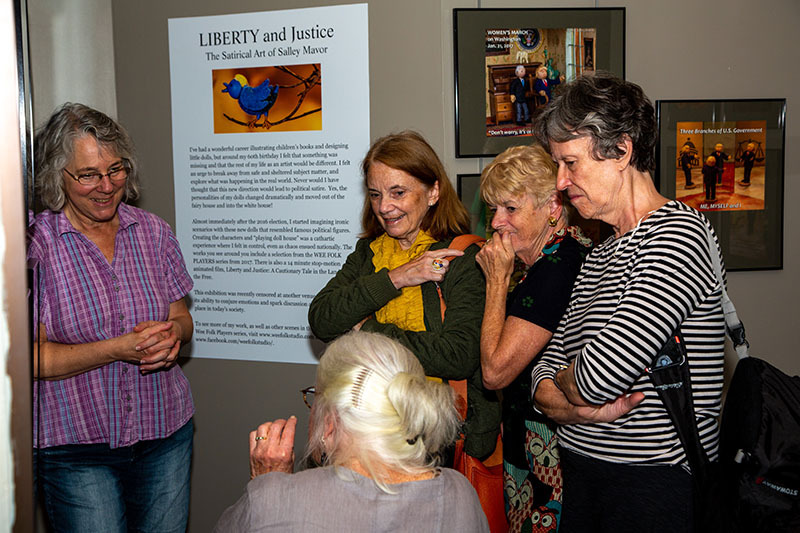 While we were there, we happened to meet members of a Boston area museum club, who came specifically to see my show, which they heard about on the news. You can watch my interview on WGBH TV’s Open Studio program with Jared Bowen here. The group was enthusiastic about both my political satire and earlier work, which they were not familiar with. One of them remarked that she especially liked the history lesson with authoritarian leaders at the end of the Liberty and Justice movie. I found her comment interesting, since that is the scene that has created the most fuss. I think it helps that the museum has presented my work in context, with signage explaining each part. Museum director, Nora Burchfield told me that they have received no complaints about the exhibit. On the contrary, several visitors have made extra donations as a gesture of appreciation to the museum for having the bravery to show my new work. In the photo below, I’ve just pointed out how the nursing mother in “The Red Chair”, until recently, was my most edgy piece. The exhibit is up until Dec. 30, 2018, so I encourage you to make the trip to Lowell if you can. I know that some of you from far away have mentioned that you plan to go when you’re in the Boston area for work or family visits this fall. 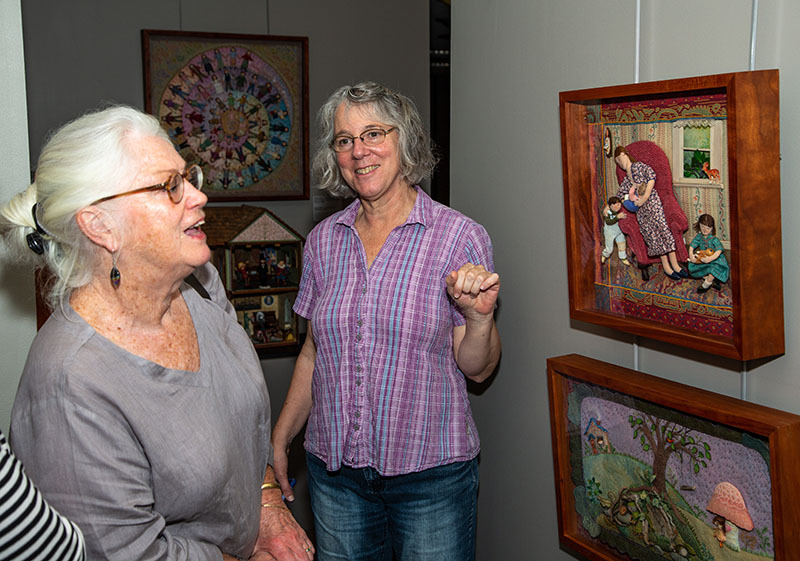 Next year, the exhibit will travel to the Cotuit Center for the Arts in Cotuit, Massachusetts, March 2 – April 20, 2019. 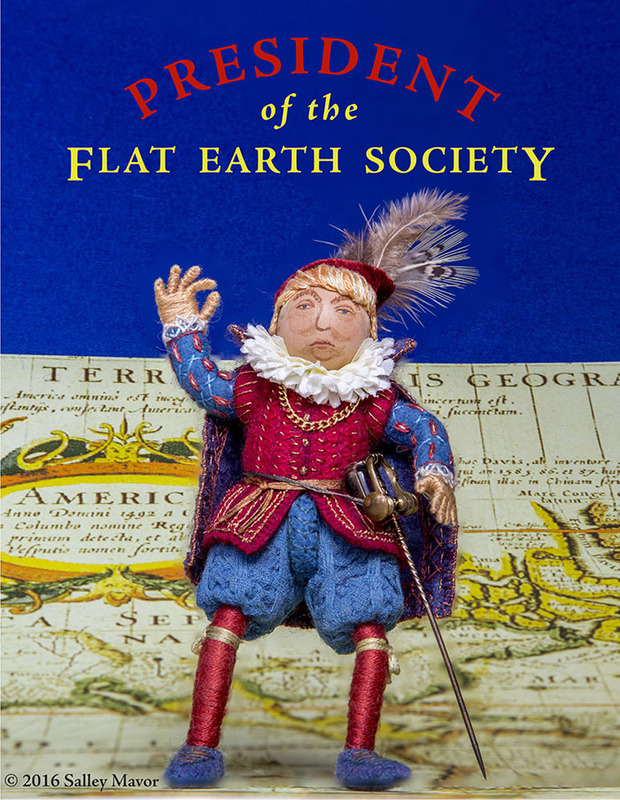 Artist Talk – “Sweet to Satirical”, Sat., April 13, 2019 at 11:00 AM. The doll house I used as a set for the Wee Folk Players series is in the hallway between the two galleries. When I made the house 40 years ago, I remember noticing how the project consumed me night and day, which was in contrast to other people my age, who were focused on finding a mate. Above it hangs my Self Portrait: A Personal History of Fashion. 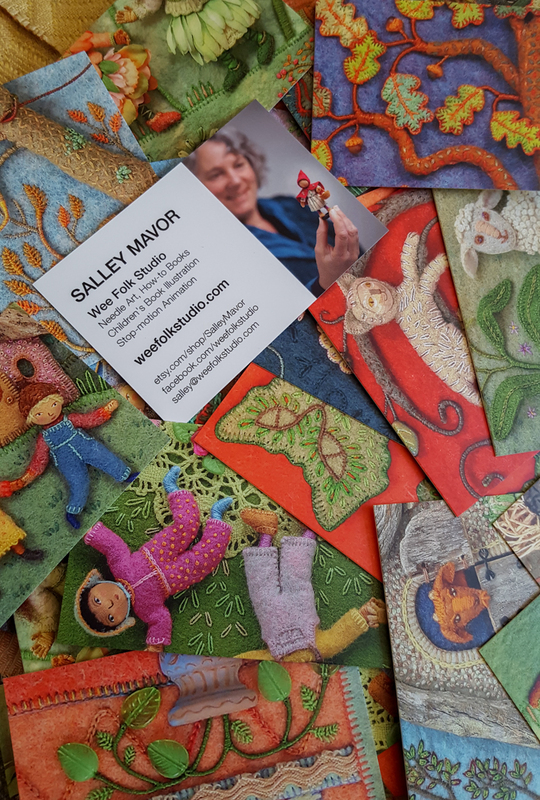 Salley Mavor will talk about her evolution as an artist, from portraying a safe and idyllic existence in children’s books to tackling real world political issues. Using examples of work from the past to the present, she will show her transition from sweet to satirical. 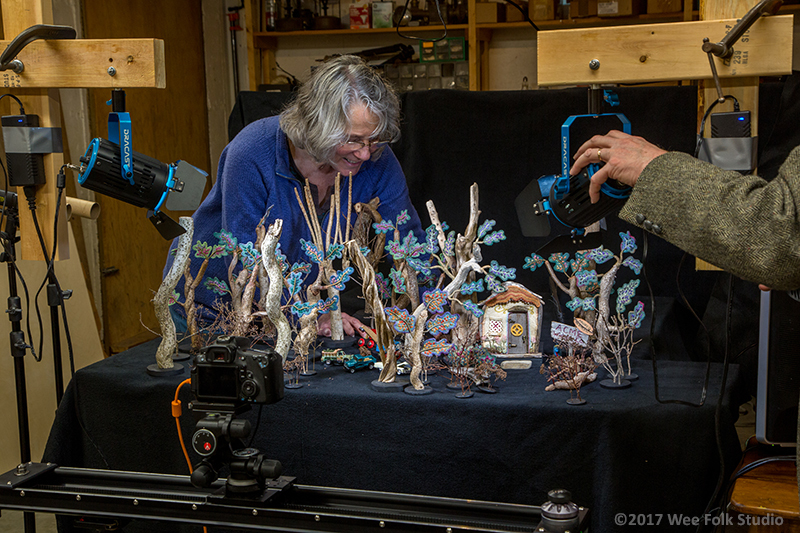 This is an opportunity to take a behind the scenes peek at her creative process as she develops dolls, props and scenery for her Wee Folk Players theater troupe and stop-motion animation project, Liberty and Justice: A Cautionary Tale in the Land of the Free. Ms. Mavor will discuss the response to her political work, its effect on her future artistic endeavors and she will address the censorship issues surrounding her exhibit. 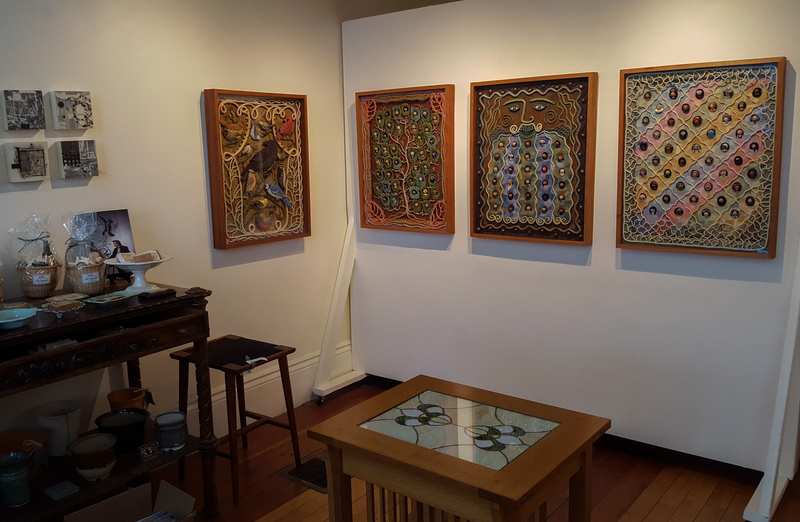 I would like to express my sincere gratitude to the New England Quilt Museum in Lowell, MA (Sept. 26 – Dec. 30, 2018), and the Cotuit Center for the Arts in Cotuit, MA (March 2 – April 20, 2019) for quickly stepping in to host my exhibit after it was abruptly cancelled at another venue due to its political content. Both organizations reached out early to express their interest and put their full support behind my project. 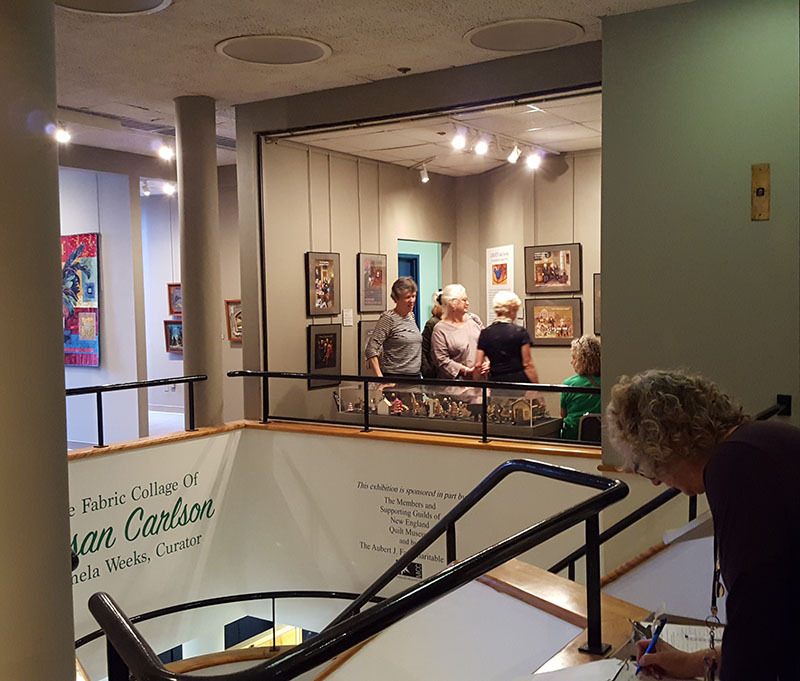 My show, which opened last week, has gotten a lot of press attention due to the controversy surrounding it and the museum is expecting many visitors, from both the local Boston area and out of town. It will be on display until the end of the year and I hope that some you from near and far can fit a trip to Lowell into your schedule. To watch my interview about the exhibit on WGBH TV’s Open Studio, click here. Almost immediately after the 2016 election, I started imagining ironic scenarios with new dolls that resembled famous political figures. Creating the characters and “playing doll house” was a cathartic experience where I felt in control, even as chaos ensued nationally. The works in this exhibit include a selection of photographs from the WEE FOLK PLAYERS series from 2017. There is also a 14 minute stop-motion animated film, Liberty and Justice: A Cautionary Tale in the Land of the Free. Original dolls and props from both the film and the Wee Folk Players series are on display in a glass case. And you can see the doll house I made over 40 years ago, that served as a stage set for the Wee Folk Players. 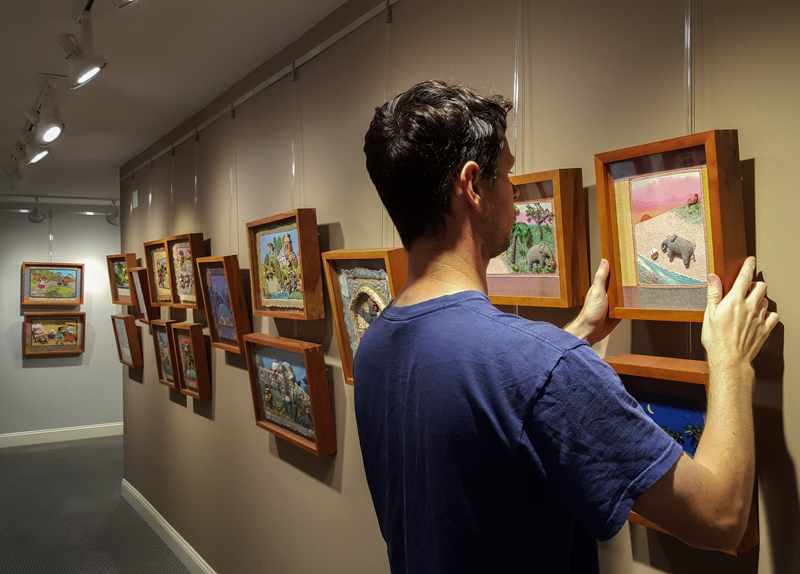 NEW ADDITIONS – the museum has expanded the original exhibit to include a gallery full of sculptural embroideries that represent the mid-period of my career, when the bulk of my work reflected a bucolic and comforting existence. This collection, from what I call “the innocent years”, serves as a contrast to my recent foray into political satire, illustrating my evolution as an artist. 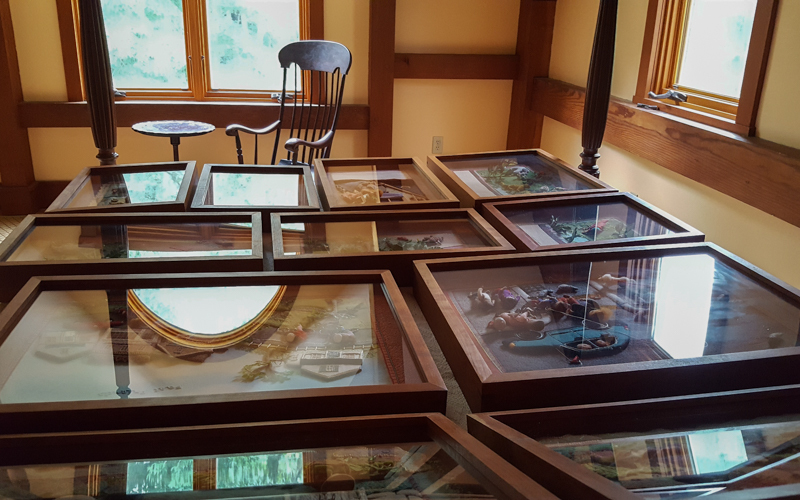 This summer, while organizing and hanging my retrospective exhibit at the Falmouth Art Center (Aug. 1- 31), I’ve thought about children’s picture books and reflected on the wonderful opportunity they present to visual artists. The story book structure provides a unique opening to the imagination, with both writers and artists doing their part to interpret and articulate the human experience into something tangible and accessible. It’s a great responsibility to connect with children through picture books and create their first introduction to art. I want to show the reader something they can care about and attach to. Adults call attention to my labor-intensive and inventive approach to illustrating; children respond directly to the emotional gestalt of a story with pictures. 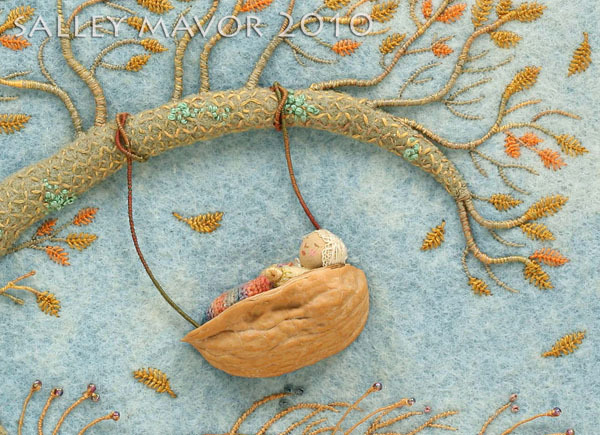 I try to keep that in mind while I stitch and stitch, translating the images in my head into something real. 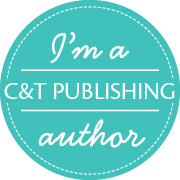 On Tuesday, August 15th at 7:00 pm, I will participate in the presentation ~ Meet Our Local Picture Book Creators at the Cataumet Schoolhouse , Cataumet, MA. The writer/illustrator team of Jim & Deb Bowen will also talk about their work. 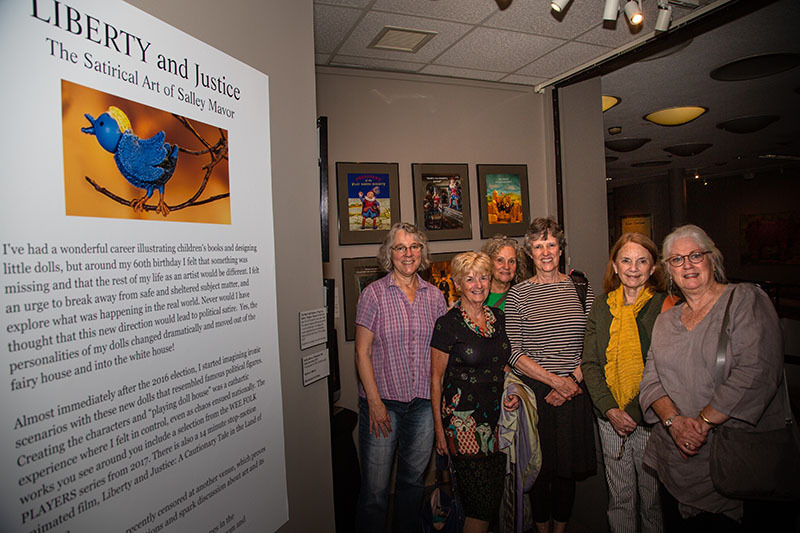 For those of you from far away, I’ve taken some short video tours of my exhibit, Salley Mavor: 25 Years of Picture Books. More videos are at the end of this post. Reflections on the glass make it a challenge to photograph the framed artwork, but I think the videos help give a sense of the show. Lately, I’ve been describing myself as a visual storyteller because the term “illustrator” just doesn’t seem to fit anymore and adequately encompass what I do. All of my work is narrative, but not necessarily illustration. And as for terms to describe how I make things — I don’t even try to define it anymore. 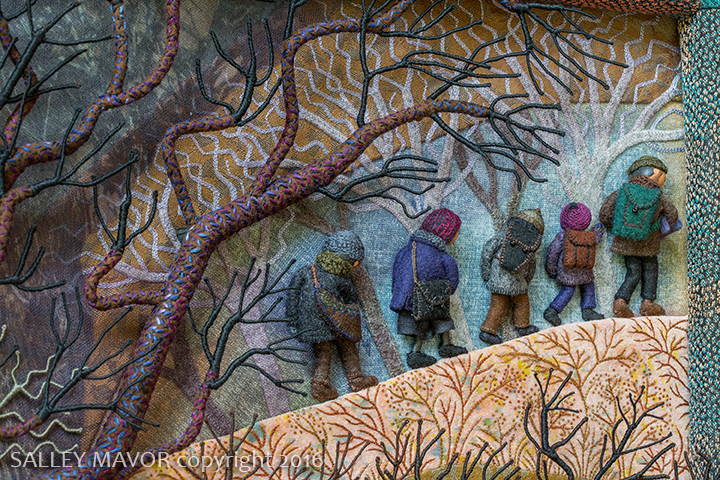 I make picture books, how-to books and stand alone fabric relief pieces like Displaced. 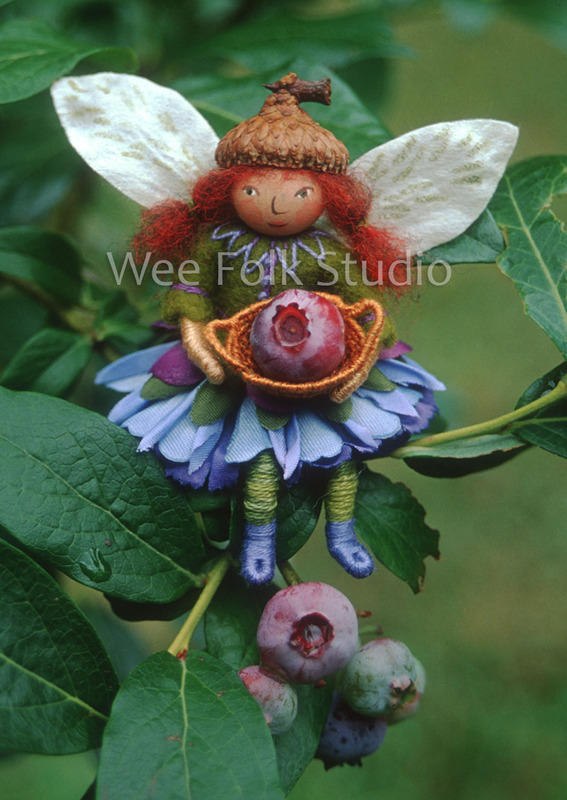 There are also fairy houses, wee folk dolls and sculpture. 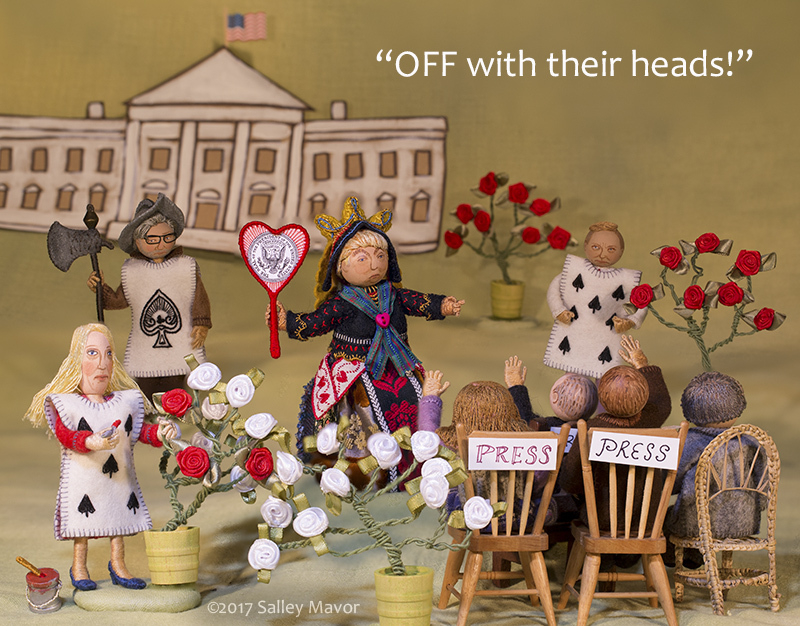 This past year, political satire and stop-motion animation from the Wee Folk Players – They’re a Stitch were added to the mix. By the way, if you’re missing the Players, they are busy filming on location in the basement. My husband Rob and I are making progress with the animation and have made about 2 minutes into a 10 minute movie. 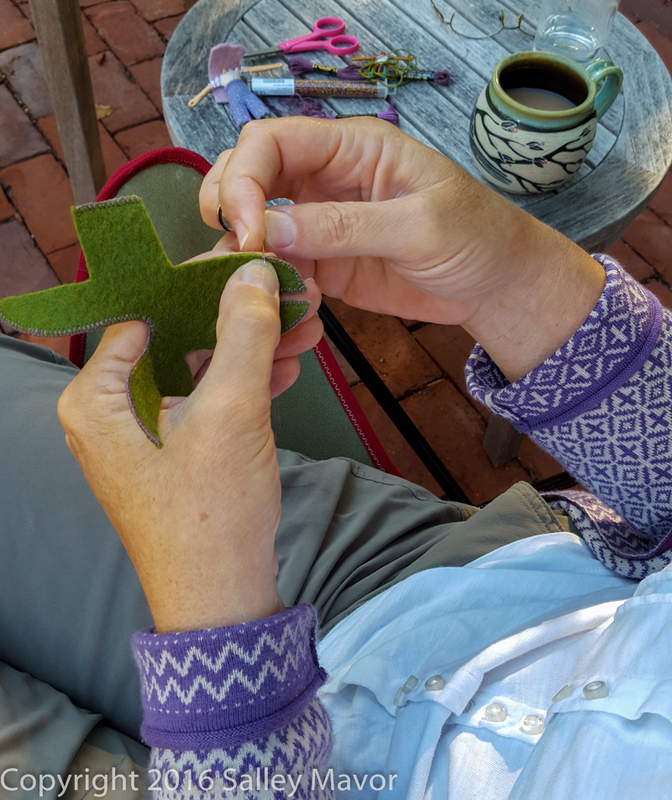 After taking 3 years to complete Pocketful of Posies (2010), I needed a break from the all consuming process of making a book, so I could be free to develop other ideas that have been tugging at me for a long time. I’m glad I spent the last few years experimenting with new subjects, but I’m happy to say that the picture book bug has returned. It’s too early to say much about the new project, but I can tell you that it’s about beds, has an international theme and will be published by HoughtonMifflin in 2020. I’m not sure how much if anything I can show, because this is the first time I’ve worked on a book while also keeping up a blog about my artwork. I figure it’s OK to show details of the process, but not the whole pieces. So, if you want a more frequent inside glimpse, please follow me on Instagram and Facebook. 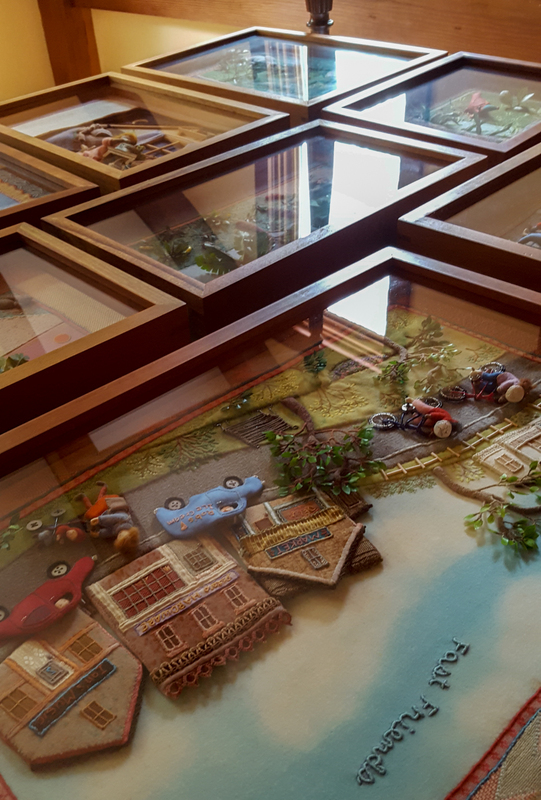 Here are a group of detail shots I took of some fabric relief originals in the show, while cleaning the frames and glass. 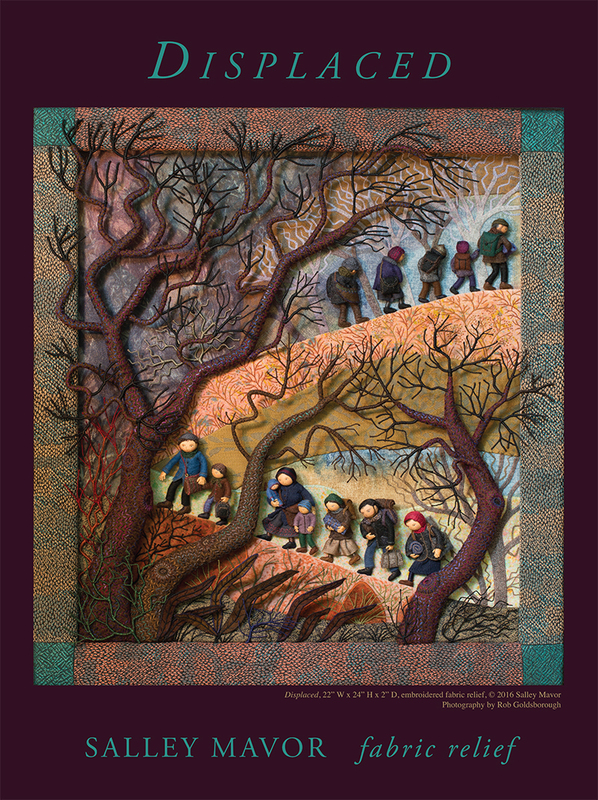 Last year, it occurred to me that it’s been 25 years since my first children’s book, The Way Home was published. Reaching the quarter century mark seemed like a good excuse to gather a representational selection of original illustrations from my 10 books and display them together. So, I’ve been cleaning glass and spiffing up a number of framed pieces to show. Some of the illustrations are on loan from private collectors, some are ones I’ve kept and others will be for sale. 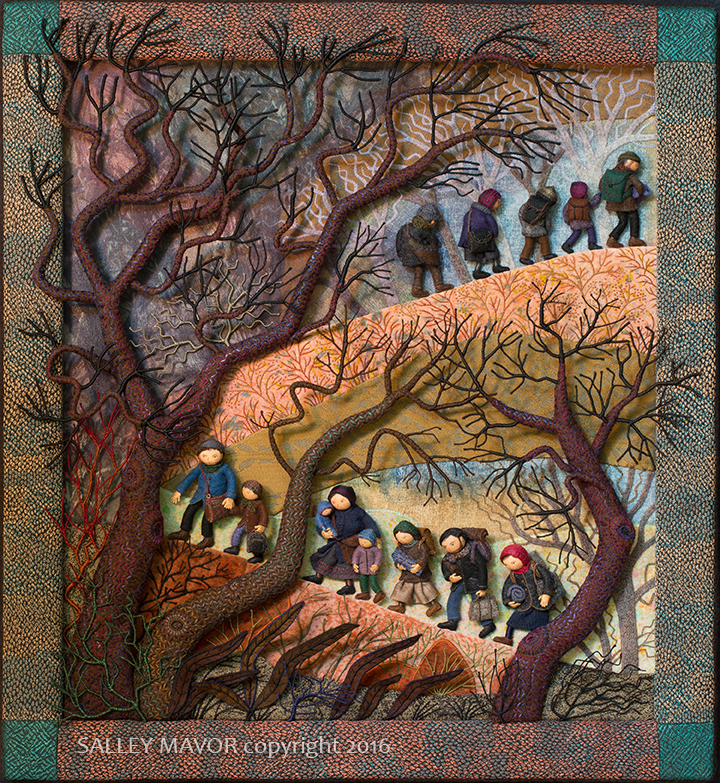 The exhibit, Salley Mavor: 25 Years of Picture Books, will be on display August 1 – 31, 2017 at the Falmouth Art Center, in their upstairs gallery. The opening reception is Friday, August 4th from 4:00 to 6:00 pm. It doesn’t seem that long ago that the first copies of The Way Home arrived in the mail. I remember bringing the book in to read to my son Ian’s kindergarten class. He claimed a spot on my lap, not sure if he liked the idea of sharing me with the other children. No sooner had I held up the book and started reading the opening lines, than he reached up and covered my mouth with his tiny hand. Usually quiet and undemanding, he sure knew how to get his point across! Fast forward to now — Ian is a talented artist in his own right, who will be working toward a Master’s degree in painting this fall. 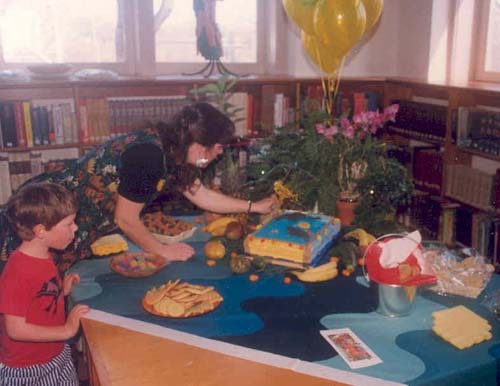 Here we are in 1991, setting up for the book party at the Woods Hole Library. 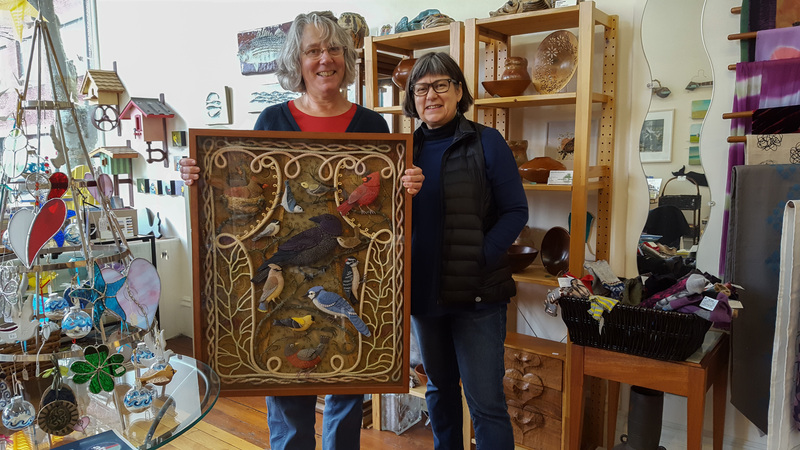 The retrospective exhibit at the Falmouth Art Center will include original fabric relief illustrations from the following list of titles. For reference, a copy of each book will be available to look at in the gallery. If you make a trip to Falmouth (on Cape Cod) to see the show, make sure to visit our wonderful book store, Eight Cousins, which has autographed copies of Pocketful of Posies and In the Heart. 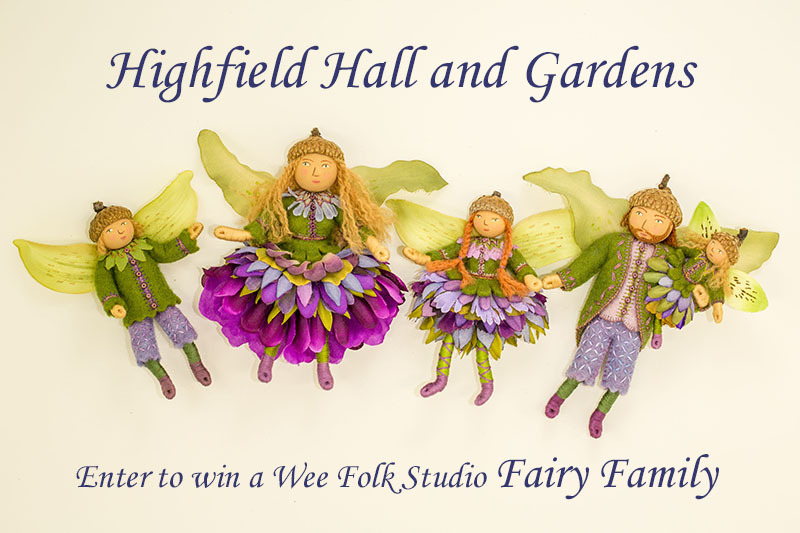 And while you’re in town, don’t miss the Storybook Fairy Houses Exhibit at Highfield Hall and the Fairy Family Raffle. POCKETFUL OF POSIES: A TREASURY OF NURSERY RHYMES published by HoughtonMifflin, 2010, ISBN 978-0-618-73740-6, Order autographed copy from my Etsy shop. A complimentary copy of In the Heart is included with purchase. WEE WILLIE WINKIE Board book published by Houghton Mifflin in 2006, ISBN 0-618-49640-8, Out of print. HEY DIDDLE DIDDLE! Board book published by Houghton Mifflin 2005, ISBN 0-618-49638-6, Out of print. MARY HAD A LITTLE LAMB, Board book published by Houghton Mifflin 2005, ISBN 0-618-49637-8. Out of print. JACK AND JILL, Out of print, Board book published by Houghton Mifflin in 2006, ISBN 0-618-49639-4. Out of print. THE HOLLYHOCK WALL, Out of Print, written by Martin Waddell, illustrated by Salley Mavor, Hardcover edition published by Candlewick Press in 1999, ISBN 1-56402-902-6, Paperback edition published by Walker Books in 2000, ISBN 0-7445-7732-2. MARY HAD A LITTLE LAMB, Out of print, published by Orchard Books in 1995, ISBN 0-531-06875-7 Hardcover edition, ISBN 0-531-07165-0 Paperback edition. THE WAY HOME, Out of print, published by MacMillan in 1991, ISBN 0-370-31 645-2 Hardcover edition, ISBN 0-689-71790-3 Aladdin Paperback edition, Read the 5-part story about making The Way Home here. The Fairies have persevered through our winter of discontent and are resilient enough to come out of hiding this summer. 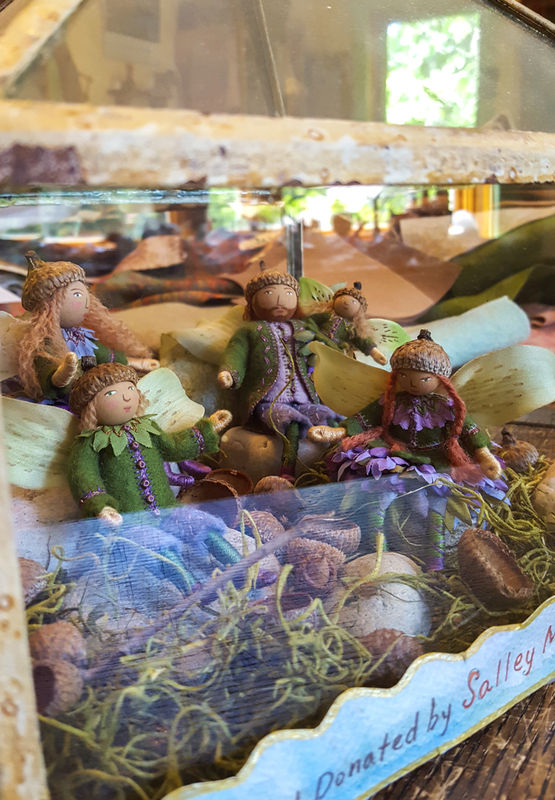 A family of 5 will appear on Cape Cod during the Storybook Fairy Houses display at Highfield Hall and Gardens, June 25 – Sept. 4, 2017. And by the end of summer they will go to live with the lucky winner of the FAIRY FAMILY RAFFLE. I do not normally sell one-of-a-kind dolls, so this is a rare opportunity to have a unique set of your own. Tickets ($5.00) may be purchased online here. After the winner is picked on Sept. 4th, the Fairies will fly to their new home anywhere in the world! The winged and festively dressed family, which includes Mother, Father, brother, sister and baby have been patiently awaiting today’s coming out announcement. 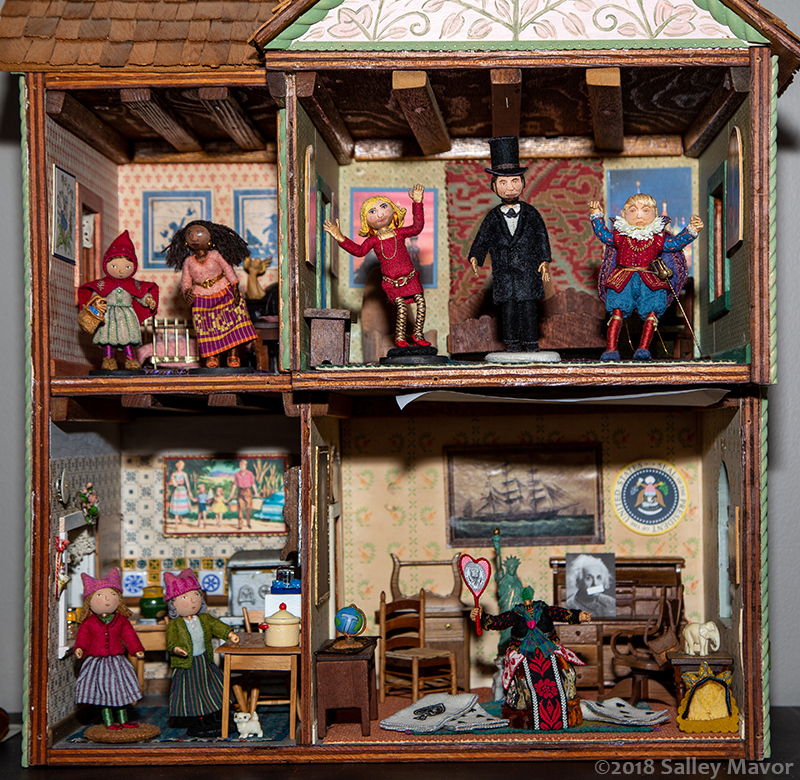 Knowing that things would get busy in the studio, I made the doll family way ahead of this year’s Fairy House exhibit. Needless to say, it’s been a whirlwind of a time, so I’m sure glad that they were finished about a year ago. All proceeds from the raffle will benefit Highfield Hall and Gardens. 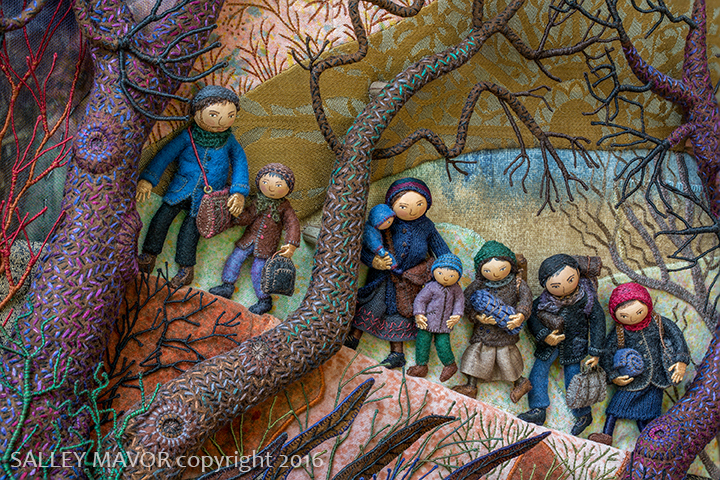 This year’s family is similar to the one I made 2 years ago for the last Fairy House Exhibit in 2015, which you can see here. 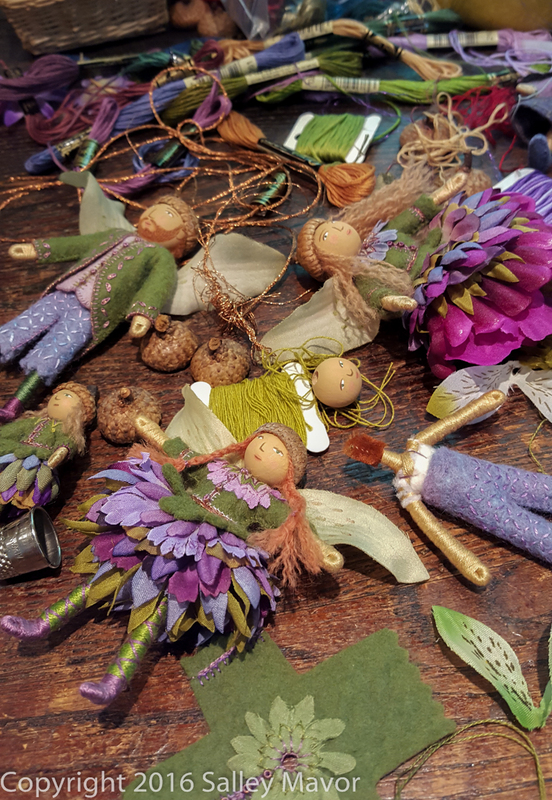 Patterns and directions to make the dolls are in my how-to book, Felt Wee Folk – New Adventures. 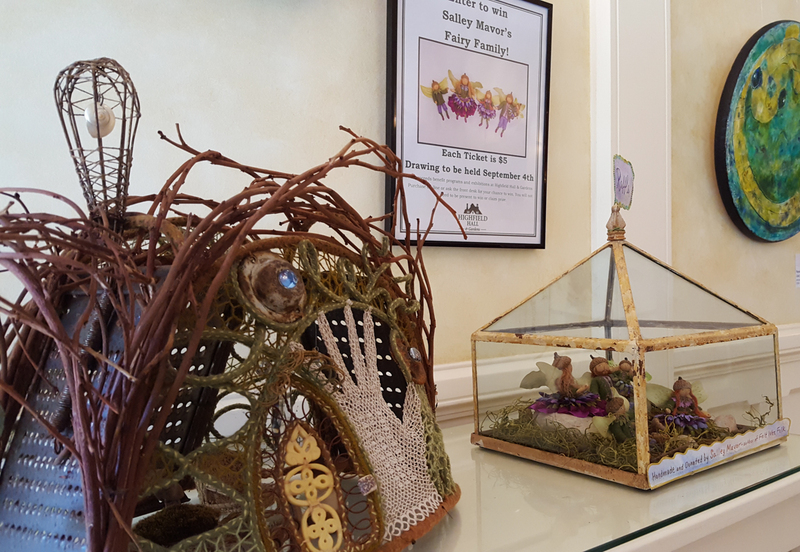 Fairy houses have become an eagerly anticipated tradition at Highfield Hall and this year’s exhibit should be just as unique and varied as the previous displays. I had the pleasure of organizing and curating the first two exhibits in 2013 and 2015, with the understanding that those responsibilities would be passed on once the idea had been sufficiently launched. Since I couldn’t spare a month to make a new house for this year’s exhibit, Grate Hall will be back for a second viewing, this time inside the museum. See the process of making it here. 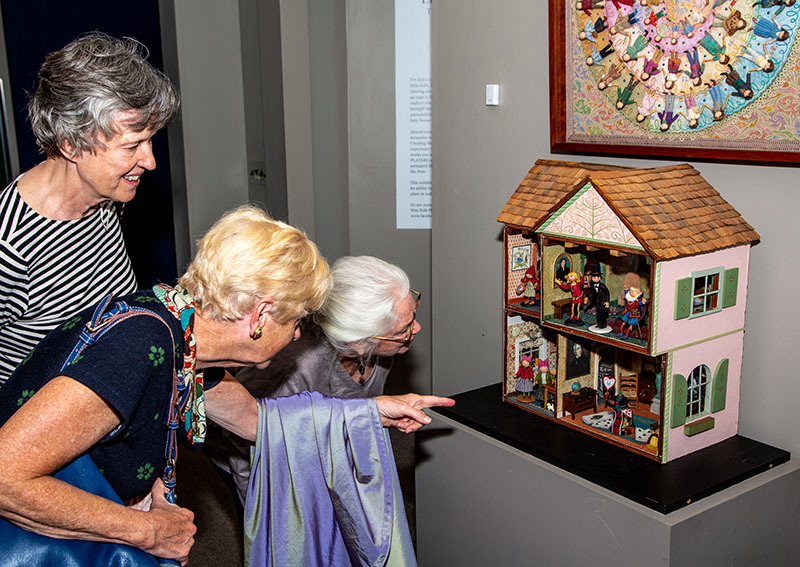 This year’s exhibit, Storybook Fairy Houses is curated by museum staff. 25 builders chose a favorite children’s book that inspired their creation. 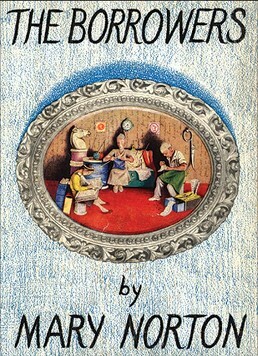 I picked The Borrowers by Mary Norton. As a child, I devoured The Borrowers series, with its tales of little people living by their wits under the floor boards. I can still remember the book’s descriptions of making a bed out of a discarded match box and fashioning tables and chairs from wooden spools. The whole premise sparked my imagination then and still feeds into just about everything I make today, from my work in children’s book illustration to the creation of my wee folk world. My fairy house, Grate Hall uses the same concept of reusing household items to make and furnish a small scale shelter. The cheese graters and whisk were saved when cleaning out a departed relative’s kitchen supplies and the single glove was found in a box of my grandmother’s lace memorabilia. Other parts include old door knob plates and a chandelier crystal. The overall structure is held together with wire that is covered with pieces of felt. Branches pruned from blueberry bushes cover the roof and the door is decorated with carved bone charms. 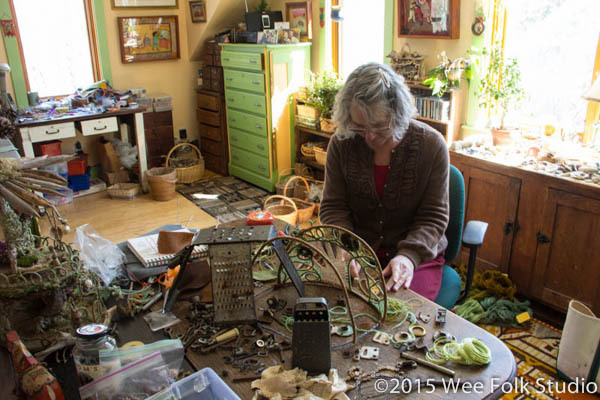 Using found objects is like editing a poem — it’s always challenging to decide what to include and what to leave out. Many very cool items were rejected in the process and they will just have to wait for another opportunity to shine. 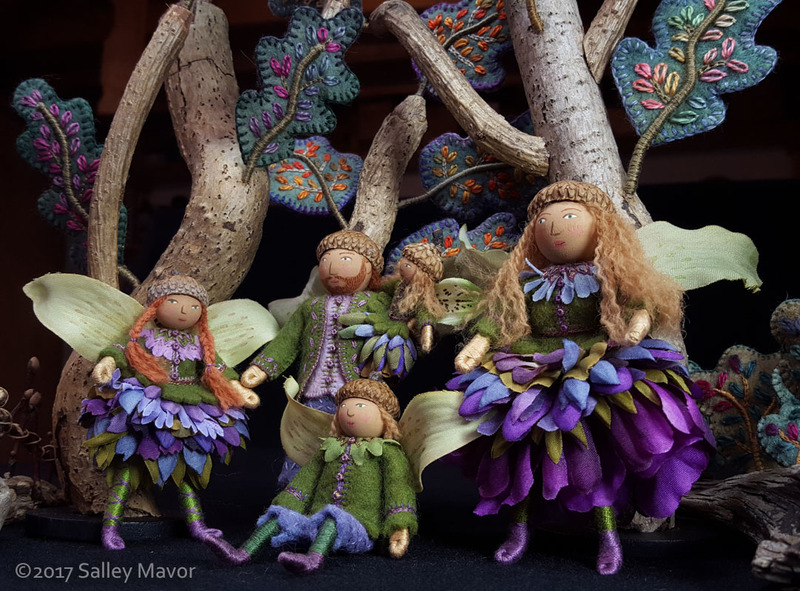 The Fairy Family is on display at the museum and raffle tickets may be purchased on sight or online. The drawing will be on Sept. 4, 2017. This opportunity is open to all and the dolls will be mailed to the winner anywhere in the world. All proceeds from the raffle will benefit Highfield Hall and Gardens. I have been touched by the heartfelt reaction to Displaced, which was first shared in photos and exhibits last year. Even though my piece is inspired by current world events, it could very well represent the universal and timeless plight of refugees throughout history. When I saw the show’s title, Pathfinders: New Territories listed in a call for entry, I knew I had to enter Displaced. The theme description on their prospectus defined pathfinders as any person, group, or idea that is visionary in nature and blazes new ground. 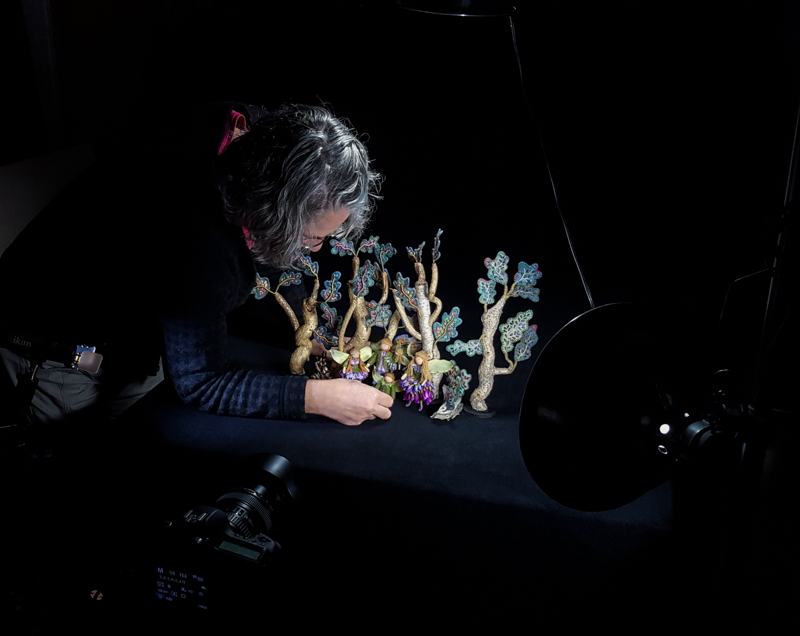 I hope that some of you will have the opportunity to see the show and view the piece in person this summer. To get a behind the scenes glimpse about making Displaced, please see this previous post. 18 x 24 Posters of Displaced are available from my Etsy Shop here.